» An Advertiser Who Has Made The Mistakes So That You Don't Have To, I Know What Works! » Someone who will WORK to Help The Bottom Line of the Company! Thor Marketing was created to help small businesses and start-ups not waste money on Marketing and allow Thor Marketing to help them spend wisely while still climbing to top of Google in the right way. Wasteful spend is horrible in all aspects of Marketing but Digital Marketing is so tough because there are so many "experts" in the field. I am nowhere near expert level and personally don't want to be, my goal is to help you succeed and to see the company do well! Our Motto is #TruthinMarketing it is also our Hashtag on Instagram, Facebook and Twitter, feel free to shorten it and use #TM as well. 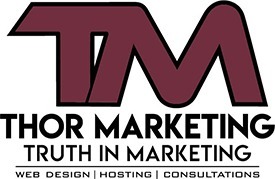 Follow this link to the page we have created for more on Truth in Marketing by Thor Marketing it will open in a new window/tab so you will not leave our website.